Valued at $100's you save! 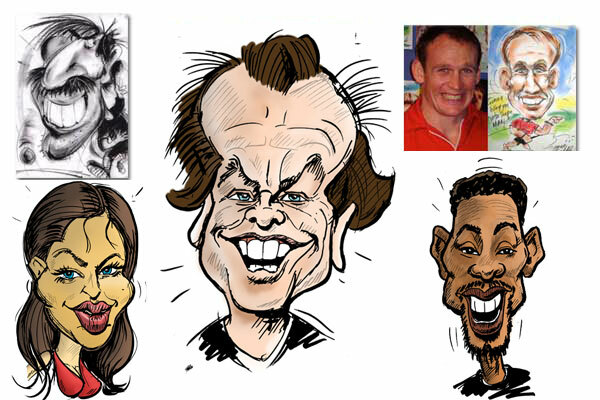 RE: Caricature Trade Secrets Revealed! My name is Graeme Biddle, I am a highly successful caricature artist with over 30 years experience and I would like to share with you my secrets that I am about to take with me into retirement. Once I am out of the market and relaxing on a beach somewhere, ALL MY SECRETS will be retired with me. I have made a tremendous career out of knowing how to draw caricatures for over 30 years and I have been paid very richly for something that has been fun and easy to do. It has amazed me just how many secret markets for this sort of work I have had to myself. So since I am about to be off the scene for good, I thought it might be a worthy idea to pass on my TRADE SECRETS, so some other up and coming artists like yourself could benefit from all my hard-earned wisdom, tips, tricks and techniques. 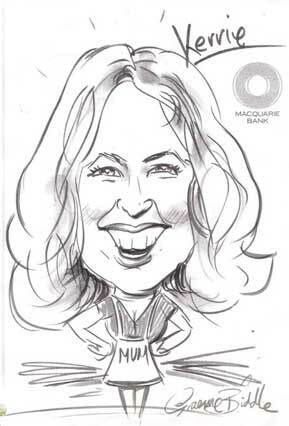 Imagine ... having the skills to draw caricatures that most people will not believe you could do! Imagine … making extra money for drawing funny faces that is really easy to do! Well, it isn't if you know how, by finding the easy way to learn to draw caricatures. while others fall flat on their faces. Success in 7 Days from Now! At last! Your exclusive pathway to learn to draw caricatures successfully and make a little extra money from your art skills. 30 Years in the making - yours to take! "I could never do that!" but the truth is, with study and practice almost anyone can!" 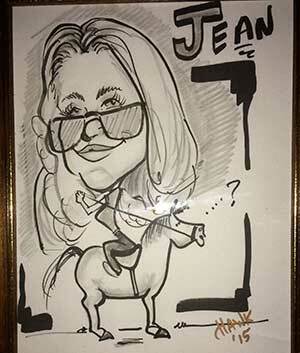 Thanks for writing Fun WIth Caricatures.The program was the foundation which enabled me to start creating caricatures that people found entertaining and for which they where willing to give me money! I had no previous formal training yet people are amazed and delighted at what I can do in 5 minutes with a marker and a pencil. I often hear the comment from people watching me draw, "I could never do that!" but the truth is, with study and practice almost anyone can!" "I am making money NOW as a caricaturist on the docks of Kona Hawaii"
Thank you for the email. I am making money now as a caricaturist on the docks of Kona Hawaii.....thanks for your quick 21 day schooling. Soooo good! I am a well resepected Master Muralist www.crazymurallady.com and already had an art background but needed the skinny on doing caricatures for money. I have been the keynote speaker at the 7th Annual Canadaian Mural Convention and successfully sold my Crazy Mural Lady business in Florida before moving to Hawaii. Your course served me wel." "Thank you, I've got a lot of enjoyment the first level course, sorry I didn't invest in the big package the first time but was watching the budget." Thank you very much for your FUN WITH CARICATURES course, I must say I ordered it with the usual reservations of purchasing something off the internet but it was excellent. I found it informative and loaded with practical drills and suggestions. If one is willing to put in the time and effort you can produce good results in a surprisingly short time. I enjoyed the course so much I plan on ordering the "Pro" version as soon as possible." “I’m still doing the course but as ever, life gets in the way. The material is fantastic and I’m hoping to get some more practice in soon. I’m up to day 7 at the moment." "Worth Every Cent I Paid"
“I was so excited to see the caricature, it was woryth every cent I paid. I will be using it on my website". "What You Have Come Up With Is Outstanding"
I know you're probably still skeptical and a bit on the conservative side, but think about this ‑ if you keep doing the same things over and over again ‑ you'll only succeed in getting the same results. That's why I want to let you try out my proven “ Fun With Caricatures – 7 Days to Cartoon Success” learn to draw caricatures home study course completely and totally risk‑free! (I'll tell you about my unique guarantee in a moment). So Who Is Artist Graeme Biddle Anyway? 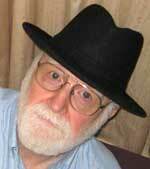 For over 30 years Artist Graeme Biddle has been drawing a living from cartooning and caricatures. 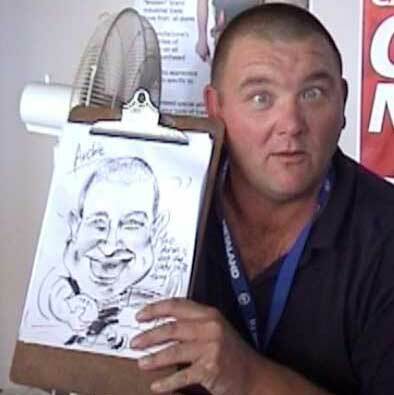 Along side of his constant stream of clients Graeme has managed to avail himself to teach others with his cartooning and caricature lessons for the lucky few who have lived in close proximity to his art studio. Over the years with much travel to more than 27 countries around the globe, Graeme has taught literally hundreds of students how to draw and cartoon better with many going on to their own successful art careers. All with the simple ability of making money drawing fun caricatures in all sorts of places that most artists would not think of looking to find this type of work. Which of These Powerful Secrets Could You Use to Bolster Your Ability as an Artist? Secret cartoon techniques that make everything from your subjects pose to the fine details of your subjects “eyes and smile” so simple, that even if you have never draw a cartoon before you could easily learn! The almost completely forgotten and entirely over-looked Secret supply of cartooning work that nearly every artist misses out on! The Secret no-bones-about-it approach to facial feature exaggeration and when it is safe to use it without ever upsetting your subject! 3 Easy Ways to make caricaturing instantly profitable – plus lots more fun ways to learn to draw caricatures. So What’s Included In the Total Package? The entire 90 page ebook delivered by immediate download to your desktop for you to begin changing the course of your art career today! Now if you’d like to actually see a few sample chapters from this amazing how-to resource just sign up below for our FREE “Fun With Caricatures” preview. You’ll get emailed secret links to take a look at the home study guide from several of the sections. You will receive your first “secret link" in a matter of seconds. This is our gift to you, so you can learn from and study (all free). Well, realize this, the “ Fun With Caricatures - 7 Days To Cartoon Success ” home study course could easily sell for a thousand dollars or more. In fact, if you asked a top caricature artist like myself, to produce “Fun With Caricatures – 7 Days To Cartoon Success” home study course for you, you'd be charged in the neighbor­hood of $1,000 to $2,000, not including the cost of travel and accommodation to host me, Graeme Biddle at your place, which could run into an extra several thousand dollars. I currently charge a minimum of $1,500 a day for my services as a professional cartoonist. So at bare bones minimum you're getting a thousand of dollars' worth of my expert caricature tuition at your disposal. So what's the catch? Why am I practically giving this resource away? Well, it's simple. The total resource of all my experience and expertise can be delivered to you right now without any need for a physical product to be shipped, as the “ Fun With Caricatures – 7 Days To Cartoon Success” home study course can be delivered electronically by downloading it right now. Just imagine in just a few minutes you too can start to learn the secrets and techniques that other artists have jealously guarded for centuries. It will be as if I myself will be right there in your living room, taking you through the 7 days to Caricature Success – without the expense of my normal fees of private tuition. You Get these 2 FREE Bonuses for Ordering by Midnight . valued at $40 - yours FREE! Bonus Gift #2: Free Website Gallery template (please note, this a blank html file for you to put your pictures in) for displaying your portfolio of caricatures valued at $50 - yours FREE! Dont' like it? Then you get your money back. It's that simple. You've got 60 days to read, play, experiment and earn more money. 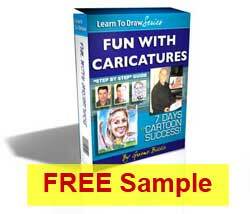 I personally guarantee that if you follow each simple step of my “ Fun With Caricatures – 7 Days To Cartoon Success” learn to draw caricatures home study course you will be equipped to not only amaze people with your newly honed cartooning skills but you will be able to find a way of making a little extra money, that will easily deliver a extra cash working part time for fun or even more per week if you become a full time caricaturist! In fact even after a full 60 Days, you honestly believe that I haven't delivered on this promise, then let me know and I'll issue you a prompt and courteous refund. Plus, the free bonus gifts are yours to keep regardless, just for your trouble. So I am here to help you and if you follow my instructions as laid out in my step by step learn to draw caricatures home study course you will be able to draw caricatures just like me, if not even better. In fact some of my students are better artists than I am. I know that sounds funny to you but it is true, I have a quick and sketchy style that some think is a bit cheap and easy looking but you know what people still love my caricatures. And they pay me handsomely as well. You see it doesn't matter what sort of a drawer you are, even if you have a come-what-may still like mine, with all it's misgivings, you are still going to get people to laugh their socks off with the wonderfully funny caricatures that I can teach you to do. That means you can try out all the materials at my risk, while you see if they work for you or not. And if they don't produce, I honestly want you to ask for your money back. And I'll let you keep the free bonus gifts as my way of thanking you for giving the “ Fun With Caricatures – 7 Days To Cartoon Success” learn to draw caricatures home study course a try. 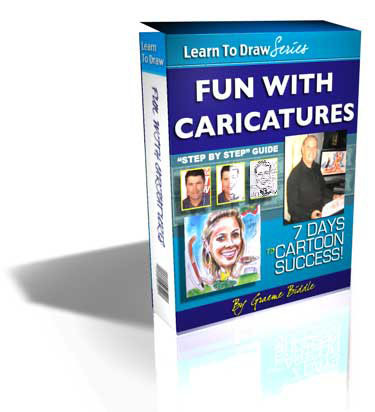 You Really Can't Afford Not to Invest in “ Fun With Caricatures – 7 Days To Cartoon Success” learn to draw caricatures home study course! 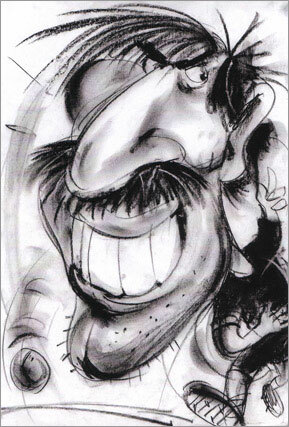 Fun With Caricatures - 7 Days to Cartoon Success Home Study Course - access online - anytime. "Just One of Graeme's Secrets Will Cover the Cost"
“I am so excited by the prospect of learning and earning like Graeme. I believe with just one of the secrets revealed I will be able to recoup my investment of $29.95 make back at least 10 times that over the coming weeks"
Awaits You - Don't Delay! Act NOW! Click Add to Cart To Download the course immediately! It's easy to get started right away just click on the “Add to Cart!” button below and you will be given immediate access to most guarded secrets on how to draw caricatures the fun and easy way, and you can even make money out of it as well. 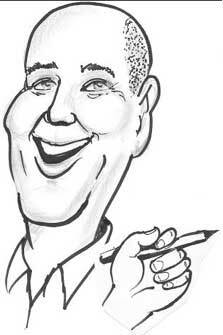 Are You Ready To Learn To Draw Caricatures Fast and Easy? Get ready to realize your potential as a finely tuned Caricature Artist who will make people laugh and that will have you laughing all the way to the bank with your extra cash! P.S. Just think! You'll never again suffer through the pain and hassle of not being able to draw clever and consistent caricatures, that will lead you to a constant and consistent supply of art work commissions drawing fun pictures that make people laugh and improve your profits handsomely! So when you tell your friends that you can draw caricatures, the only reason they will be laughing is because you will have them in stiches, when they see your amazing caricatures! Yes I am a real person, feel free to contact me!